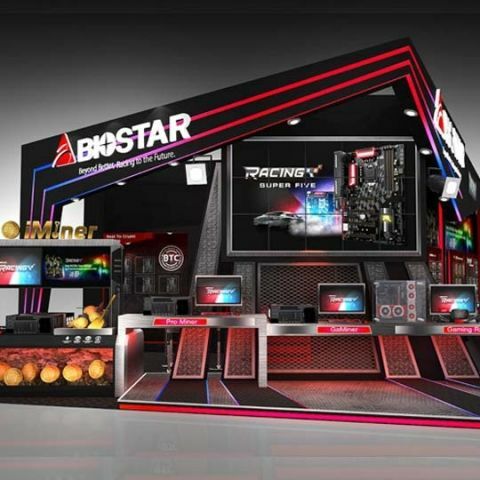 Taiwan based computer hardware manufacturer BIOSTAR is bringing its diverse lineup to Computex 2018, with offerings ranging across gaming, crypto mining, smart home and IPC solutions. They will be showcasing the latest flagship 3rd generation RACING series featuring the Intel 300 chipset motherboards for 8th gen Coffee Lake processors. On the AMD side of things, they will be featuring motherboards with the AMD AM4 X470 platform. Also available will be the newest crypto-mining and blockchain solutions based on the popular Intel 300-series BTC-line motherboards and prebuilt iMiner rigs. Visitors will also be able to see BIOSTAR’s graphics cards, NVMe SSD solutions, along with its smart home, and industrial PC solutions. BIOSTAR’s gaming motherboards at Computex 2018 feature the 3rd generation RACING series. At the event, these motherboards will be seen sporting the latest Intel 300-series chipset in the black RACING design. They will also have a dedicated experience zone for visitors looking to get a taste of the RACING series in VR using the AMD AM4 X470 platform. The newest BTC motherboards from BIOSTAR also showcase the Intel 300-series, suitable for professional and amateur miners alike, according to BIOSTAR. Additionally, the prebuilt iMiner series from BIOSTAR featuring the A578X8D/iMiner A564X12P will also be showcased, with the option to expand up to 12 GPUs. Other featured products include a smart home solution and IPC solutions from BIOSTAR. Also, expect to see a brand new introduction to BIOSTAR’s entry into the high-speed M.2 SSD category and gaming graphics cards. Can I build a gaming PC if I\'m a noob at it and only use WikiHow and YouTube tutorials?